Psoriasis is a common skin condition that affects mostly adults, but anyone can acquire it. It is not contagious and is usually appears as a thick, salmon- colored skin in flaky patches usually on the elbows, knees, arms, and legs, but can occur anywhere on the body. 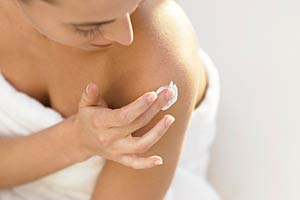 The skin in the affected area may be dry, itchy, and/ or sore (MedlinePlus, 2012). · Maintaining a healthy diet by eliminating trigger foods. · Using herbal remedies such as aloe vera, apple cider vinegar, capsaicin, dead sea salts, oats, tea tree oil, turmeric, or Mahonia Aquifolium. · Mind and body therapies like aromatherapy oils (Chamomile, Lavender, Rose, Tea tree), meditation, mindfulness, and spa therapy. · Alternative therapies include acupressure, acupuncture, massage and reiki. · Exercise including yoga and Tai Chi for stretching. Psoriasis has different levels of severity and your treatment will depend how mild or severe it is. National Psoriasis Foundation. (n.d). Psoriasis Treatments. Veronica Arispe is working on a MS in Health Studies with a focus on Worksite Health. She received a BA in Criminal Justice with a minor in Community Health in 2001 at New Mexico State University. She currently works with the Ysleta Del Sur Pueblo in El Paso, Texas as an Alcohol and Substance Abuse Prevention Specialist.